You’ve learned what The Long Tail is in general terms. Now it is time to look more closely at the implications of The Long Tail for publishing in general. Then we’ll look at The Long Tail and self-publishing in particular. Writers’ folders, wastebaskets, and hearts overflow with rejections from publishing houses. Sometimes that’s because the writer can’t actually write. But even excellent writers are rejected. Our heroes are the writers who faced double-digit rejections and went on to publish best sellers. Think J.K. Rowling, now one of the world’s most wealthy people thanks to Harry Potter. So what legitimate reasons might a publisher have for turning down a great manuscript? The book doesn’t fit the publisher’s mandate. If a how-to-garden book is sent to a publisher of science fiction, the book will be rejected. The publisher is not sure of how large the market would be. The publisher’s list is already full. Each publisher can afford to produce only a finite number of books each year. A similar book already exists or is already in production. The acquisitions editor ate too much spicy food before reading the manuscript and simply couldn’t concentrate. Well, O.K., maybe that last one isn’t so legitimate, but it is realistic. Many factors can keep a writer from being published at all. The traditional publishing industry keeps The Long Tail short by not publishing every worthy book. Don’t get me wrong, there is a Long Tail of books put out by publishing houses. Publishers do print books that do not sell in huge numbers. 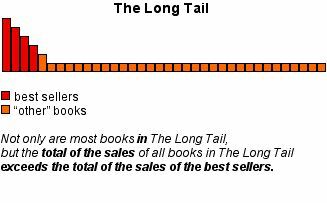 The point is that there are many more books that could be part of The Long Tail. What a writer should not assume when getting a rejection, is that there is no place for the material. If you have information that someone wants, you could participate in The Long Tail. In theory, The Long Tail is infinitely long. And in theory, there could be an unlimited selection of books and other publications. Self-publishers are the ultimate Long Tail publishers! Self-publishers produce very specific "drill bits." Since all people are basically the same, and since we write what we know, and usually from personal experience, we write what others are interested in. Together, we produce a formidable number of words. In 2003, Trafford Publishing, the world's first and still leading Canadian print on demand (POD) company, produced more books than all other publishers in Canada combined! The people who make money with self-published books know there is a need for their material. Armed with that knowledge, they publish with courage. And it does take courage! While the writer accepted by a conventional publishing company is paid up front and makes royalties later, the self-publisher assumes all costs. Considerable financial investment goes into each book. There is a flush of excitement as the book comes off the press. That lasts about as long as it takes to realize that most bookstores will not stock self-published books. Self-published books are notoriously poorly written. Under tight budgets, self-publishers cut costs at every opportunity. Editing is usually the first item to be scratched from the list. If the writer is storing the books in the garage or back bedroom, filling orders may not go as smoothly as it does when a fulfillment company is looking after distribution. Trade publishers allow returns on unsold books. Self-publishers do not. The bookstore must sell all copies of self-published books. That would be a gamble even for a best selling book. Stocking a book by an unknown self-publisher is just too risky. Self-publishers are generally ignorant about marketing. Many turn to POD companies, lured by the promise of help with marketing. Although any help is nice, the level of help from a POD company will not be significant in attracting sales. Nor will the help from companies offering to distribute press releases. Getting the message out to the target market is crucial to sales. We'll deal with this later. First, consider other self-publishing venues. Digital publishing offers the same enticement as publishing hard copy does. . .
Of course it faces the same problem of prejudice against the whole pool of unedited, poorly written, rambling hard copy that all self-publishing suffers from. But digital publishing is less expensive. Low cost is a huge attraction for many writers. Again, the self-publisher runs into a marketing wall. Even if the writer has written a book targeted to a specific audience, ignorance of how to get it to the masses can halt sales right out of the gate. Enter the Web site. The next article in this series will explain why most writers’ Web sites don’t work as a sales mechanism. This section deals with the Web site as a self-publishing medium. Increasingly, people who want information turn from books to the Internet. If I have a question at midnight, I no longer have to write it down and head for the library or the bookstore the next day (or whenever I can free up my schedule). I can find the answer at home with a good query and a few clicks of my mouse. Savvy entrepreneurs have figured this out and are pumping information into cyberspace at mach speed. Which drill bit will I need? How much should it cost? Is one brand better than another? Should I do something instead of drilling? The Internet is The Long Tail at work. People who put up Web sites are the new self-publishers. Most web publishers are not writers. Those people who already think of themselves as writers are just starting to catch on. Most people think they couldn’t possibly do anything significant on the Internet. Well, you’re living proof that you can! Because you found this page. . .
. . . a page I self-published and led you to. And I’m no smarter than you are. I’m probably less technically adept than you are. I just found a great tool for getting the job done! is a way to make a steady income. The means of publishing may vary, but the bottleneck is the same whether you publish a book, a digital product, or a Web site. Once it's written, how do you get the material to the intended audience?